Sinking Underwater: A Ghost Town's Amazing Legacy by Anita Goldwasser and Cecilia D. Craig, Ph. D.
A book on Drawbridge, California, Sinking Underwater: A Ghost Town's Amazing Legacy by Anita Goldwasser and Cecilia D. Craig, Ph. D. and published by the San Francisco Bay Wildlife Society is now available for purchase. Anita is a writer who explored the once-vibrant ghost town of Drawbridge in the San Francisco Bay Area and photographed its buildings more than 30 years ago—before most of them sank into the marsh or succumbed to fire. Cecilia (Ceal) Craig is a long-time member of the San Francisco Bay Wildlife Society and volunteer tour guide for Drawbridge. You can buy the book in person at our Nature Stores at the Don Edwards San Francisco Bay National Wildlife Refuge. You can also have us mail you a copy by sending us a check or making an online payment. All proceeds from the book sale benefit the San Francisco Bay Wildlife Society. Select an amount below and click on the Pay Now button to use your credit card to make an online payment via Paypal. I would like to receive news and updates from the San Francisco Bay Wildlife Society. There's a certain mystique to the ghost town of Drawbridge, California, even though it "died" 37 years ago. Because of its isolation on a marshy island, the town remains unknown - even to people who live a few miles away. This unusual community lacked streets, schools or stores and its buildings were constantly sank into swampy water. Residents had to walk three miles on railroad tracks to the nearest grocery. Their kids trudged to school on those same busy tracks. Still, residents loved its lifestyle. Why were they forced to leave? Why is the island off limits today? The town remains alive in an unusual manner. You will meet the hardy folks who lived there and learn their stories firsthand, thanks to unexpected events that took place after it became a ghost town. Photos and rare interviews with former inhabitants bring Drawbridge to life again, allowing readers to experience the town without slogging through its mud. Anita Goldwasser has had some 400 articles published on subjects as diverse as travel, humor, and business. She has been a Public Relations writer as well as a ghostwriter for a real estate book published by Dow Jones. Major newspapers have published her travel articles. Anita explored Drawbridge and photographed its buildings more than 30 years ago—before most of them sank into the marsh or succumbed to fire. Her photographs have appeared on many magazine covers and were exhibited at the Triton Museum in Santa Clara, CA. Cecilia D. Craig, Ph. D., is a retired engineer with several recent publications in STEM education for women and is a Society of Women Engineers Fellow. In 2000, she became a Fish and Wildlife Service volunteer, leading a program about Drawbridge since 2008. The program includes free tours to view Drawbridge from a Coyote Creek levee. Ceal has been an officer and volunteer for the San Francisco Bay Wildlife Society (SFBWS), a Friends group for the San Francisco Bay National Wildlife Refuge Complex. SFBWS is the publisher of this book. 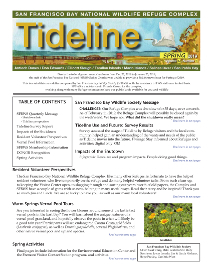 By becoming a member, you not only support us in our mission, you also get a subscription to the Tideline magazine and a 15% discount at our Nature Stores.